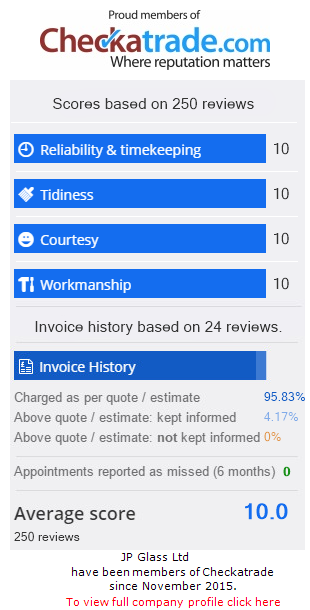 JP Glass has been a long-standing member within the glass industry and completed a variety of installations for businesses and retail customers within the area, so we’ve picked up a number of glowing reviews along the way for our unrivalled service. "Brilliant! Very nice guys, knowledgeable, helpful, and tidy." "The JP Glass fitter was courteous, respected our property, and cleaned up everything. I would recommend this company." "It is so good to employ the services of a trade and feel positive about the experience. The job was difficult. However, to JP Glass, it was not a problem and more of a challenge - great attitude! A business highly thought of and powerful, customer-focussed attitude that manifests itself in great service. Thank you." "Dan and Ken arrived promptly and were very courteous and efficient. The work was finished quickly and to a high standard. Paul, the supervisor who quoted the job, was very helpful and understanding about keeping to a budget. We wold highly recommend JP Glass and will be using them again." Contact us in Tonbridge, Kent, when you require an unparalleled service from a team of qualified glass merchants.